Our launch back onto the open road had a rough start – not figuratively, only literally. The interstate across eastern Arkansas and into Memphis was SO BUMPY that we had a couple of new surprises awaiting us inside the trailer. This is the first time we hit enough bumps for the contents of our pantry to force the door open & spill onto the floor. This was the lovely mess I found when it was time to put the slide out at our campsite. The house smelled like parsley, cardamom, and cocoa powder for awhile….could be worse! …and neatly folded itself on the floor below. In Memphis we camped at a State Park and read portions of our history book about Rosa Parks and Martin Luther King, even though we had already studied them a little bit as we travelled through the southeast. In a suburb of Memphis I met up with a college friend and her kids at the Shelby Farms Playground – a playground that has been featured as one of the top 10 playgrounds in the world in multiple publications. The recreation coordinator side of me was intrigued, and it did not disappoint. From bungee teeter-totters and swings to extensive climbing ropes and walls to sand pits and arbors, this place was really unique. An arbor separated each play area, and some were even further separated by being contained within a large, sloping, rubber pit areas. This distinction between the different smaller playgrounds within the larger play area kept the enormous space from being overwhelming. We all had a fun time exploring this place. A connected bungee swing system meant that kids bounced & swung other kids on the playground. Sunny climbing up from one of the play pit areas. One whole pit was also a sand box! Sunny loved jumping off this boulder over & over again. 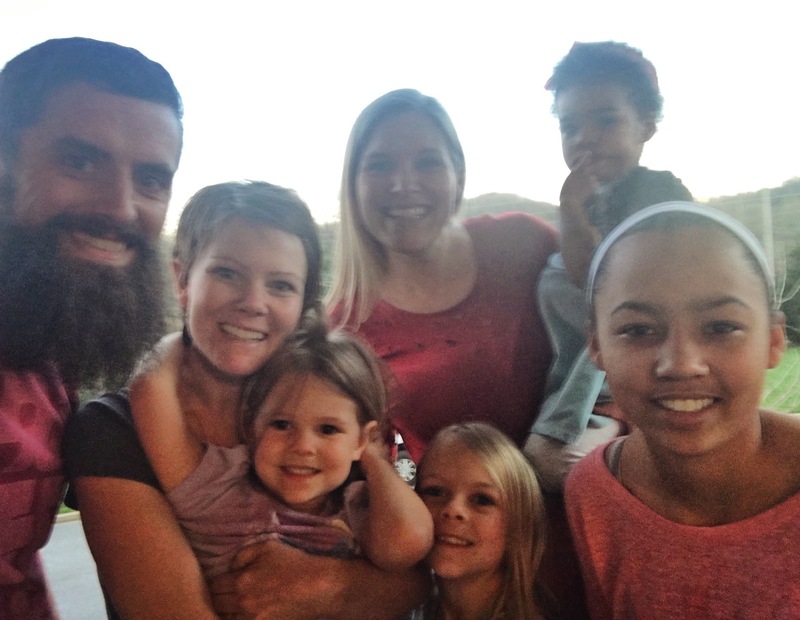 I enjoyed a great visit with my college friend Stephanie and her kiddos! Spring weather continued to keep us guessing, as we would alternate from sweating during a picnic to watching evening snow flurries in just a day or two. I looked out the window to see Sunny playing in this outfit one morning. After our stay in Memphis, we headed further east across the state. We found a great campground south of the Nashville area at Henry Horton State Park. The awesome sand box at Henry Horton even had community sand trucks to enjoy! The arrival of spring break meant the return of feral campground kids, which we have barely seen since last September! They were a welcome addition back into our lives. The girls were so excited to explore the woods with their new friends, and I was so happy for them to opt out of the camper on multiple occasions. The kids loved exploring this little ravine behind our campsite together. All these new campground friends are so great! The goodbyes are always tough. From this location near Nashville we were able to visit several friends and family members. 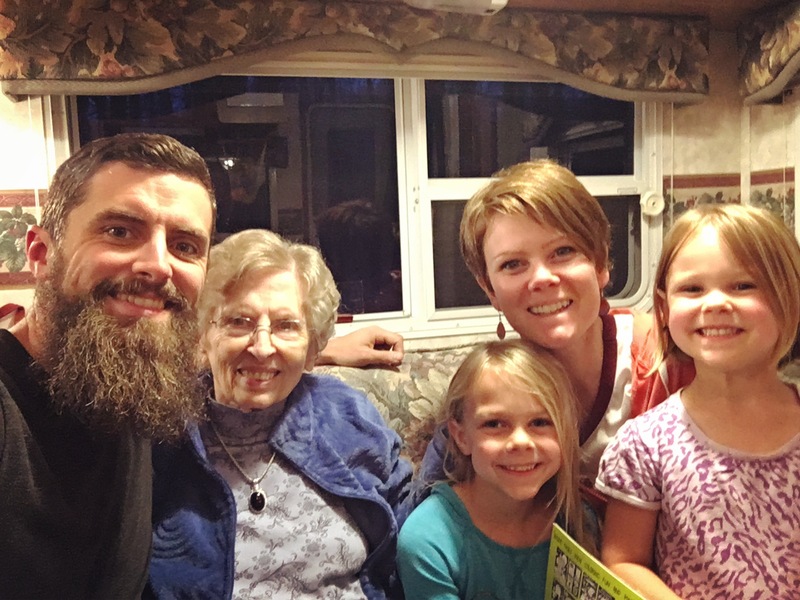 It was wonderful to have Brad’s Granny Betty out to Stumbo for dinner one night. Brad was also able to get lunch with his Uncle while we were nearby. The girls had a blast spending the afternoon with Julia Marie and Shelley. It was so great to see Jeannie & her girls! We had a short but sweet visit with the Reynolds family at the coffee shop that Darren is helping to run in downtown Nashville. It’s definitely a Nashville venue, but Darren’s fingerprints were everywhere, so it felt a lot like being back at Caffe Mela in Wenatchee! Of course the coffee shop tables are shaped like guitars here…it’s Nashville! We had a fun afternoon playdate at a Nashville playground with the Wilkins family – more great friends from our college days that we thoroughly enjoyed getting to reconnected with. We spent one sunny afternoon exploring downtown Nashville by car. (And by “car” of course I mean giant truck.) We saw the state government buildings, the Raynor Theater, Broadway Street, interesting street sculptures, and old churches. As we drove down Broadway Street we rolled our windows down to listen to the live music wafting out of every restaurant, shop, and bar. We watched the people on the sidewalks in their cowboy boots and felt like we were getting the perfect glimpse of Music City USA. We had a little picnic on the grounds of the Nashville Parthenon and enjoyed the fact that spring had sprung in some of the sunnier sections of the park. Beautiful spring blooms at the Parthenon. As close to Greece as we will get on this trip! The girls and I also spent one afternoon exploring the Science Adventure Center. It was a bit chaotic because of spring break, and some of the most fascinating-looking exhibits (like the weightless moon-walk and the virtual roller coaster) either required an additional ticket or the girls were under the height/weight requirement, so it wasn’t the best museum experience we’ve had so far. It’s Nashville, so of course the 4 story Exploration Tower has a giant walk-in guitar! The girls working together to lift a car. This museum was education meets amusement park. It was fun but VERY loud and flashy. This 3-D, life-sized puzzle was awesome, though. 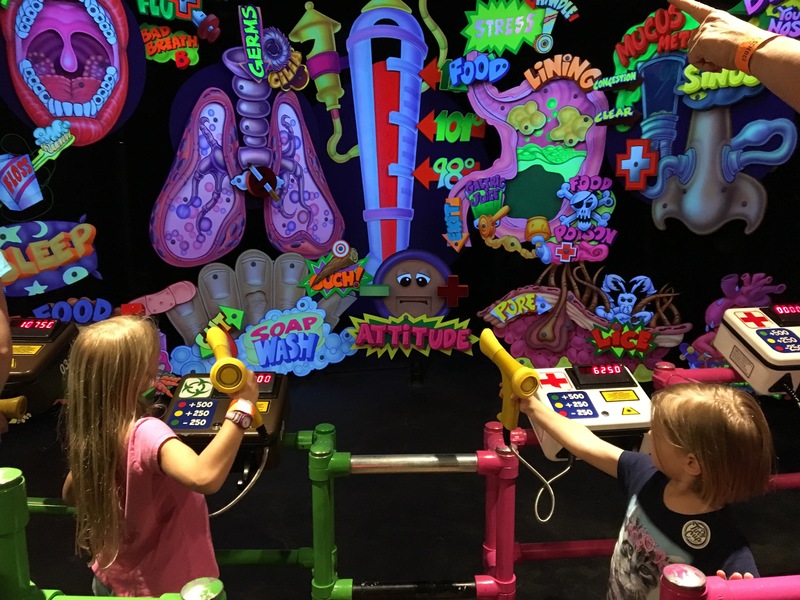 But they did have one game in the human body exhibit that was a laser gun shoot-out between pathogens trying to make a body sick and the lymphocytes trying to keep it healthy that was a blast. We ended our time there by playing it three times in a row. Lots to see and learn!